Elmúltam 18 éves. Elolvastam az általános szerződési feltételeket, adatvédelmi irányelveket, sütihasználati szabályzatot, megértettem és elfogadtam azokat. Hozzájárulok, hogy tangowire.com hírleveleket, a fiókommal kapcsolatos frissítéseket, értesítéseket, és más felhasználóktól érkező üzeneteket küldjön nekem e-mailben. Looking for love? Become a member of our online dating community. Find love in your area! Online Dating Personals for Singles, find your match today! It's free, it's fun and it's full of members looking for love! Start your journey today in 3 simple easy steps to get you on your way to finding love. It's free to join! So, use our easy 5 step sign up process. Get started today and start making connections with our free ice breaker feature! It couldn't be easier. Upload a photo now! You're 10x more likely to get attention when you have at least one photo on your profile. You can upload up to thirty photos. Let everyone see who you are! Start your search for local singles. Send a wink to those that you are interested in or upgrade to a full membership and email them. Life's short, so find that special someone to share it with today. We're so proud of our success stories that we want to share them! Do you own a mobile device? If so, use your device while you are out and about to browse matches, upload your most recent selfie, or send an email. Dating on the go! Tablet or smartphone? No worries! We're mobile friendly. Our search feature works perfectly, wherever you are! Mobile friendly site with all the features of your PC when you are on the go! Finding love on the go has never been easier! For your first photo, get a good, clear picture of your face. It works wonders. Try to upload photos that are clear, show your face in good light, and are based on things that you like to do. Complete your profile. The more you have on your profile about yourself the more people will get to know you. Members much prefer to contact those that have taken the time to fill everything out. It shows your level of commitment to others on the site. 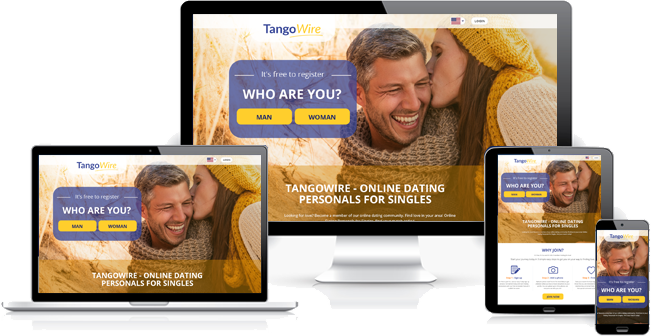 TangoWire - Providing online dating websites for singles around the world!